1921 must have been a weird (read: terrible) year to live in the United States. They were getting out of World War I but not quite in the Roaring Twenties yet. 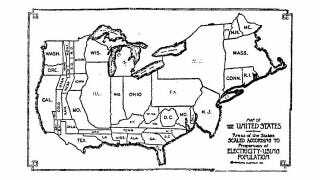 They were beginning to suffer through Prohibition and judging by this map of electricity users, if you didn't live on the East Coast, you were probably screwed when it came to electricity.